Sunday Morning with Sammy the Book Squirrel from LET'S GET THIS FOUNDATION on Vimeo. I did an interview for The Michael Jackson Special tonight on CBS. Not sure I will be in the show but I bet it's worth watching regardless. Michael Jackson was, without a doubt, the single most amazing performer that I’ve ever seen. As a young teenage boy with a dream- he was beyond inspirational. The fact that his public/private life became a soap opera and a sideshow is more of a reflection of our societies misplaced priorities than it is a reflection of the type of person that he may have been. Yet despite all of that- the fact that his performances, even of even 25 years ago, still resonate today….. THAT is a true testament to his greatness. Kiss 108 interviewed Joey recently. Click here to listen. 97 BHT - New Kids On The Block's Danny Wood w/ Ralphie! from Ralphie Aversa on Vimeo. Just sit right back and you’ll hear a tale, a tale of a fateful trip. Five passengers - in this case, New Kids on the Block’s Jordan, Jonathan, Joey, Danny and Donnie - set sail for a three-day tour, a three-day tour. On Friday the quintet of heartthrobs returns to Massachusetts for a show at the Comcast Center. But a few weeks ago the New Kids were on the high seas rockin’ the boat with 2,100 fans on a Carnival Cruise Line jaunt in the Caribbean. For just over $1,000, fans got to be part of a seafaring kick-off to the New Kids’ second consecutive summer tour, a victory lap of sorts for the group who last year thrilled their fan base with their reunion and with a new album, “The Block,” their first new music in 14 years. What could have been a madcap, “Hard Day’s Night”-esque 72 hours of dodging insane thirtysomething women - we’re picturing Donnie peering out of his hiding spot in the ship’s funnel - was actually a darn fine time for the Kids. Yes, everybody. While some passengers complained about a lack of access to the Kids, the event was so popular that a 2010 cruise is already planned. Oh, and the group also did two shows. Knight and crew quickly realized they were trapped at sea with the most diehard Kids nuts alive. So instead of waiting for stalkers to break into their suites at 3 a.m., the Kids came to the fans. “We went on the offensive and started crashing other people’s rooms,” Knight said. “We had a competition of who could decorate their door the best with posters and memorabilia. We went around and picked doors we loved and banged on them to bring them room service. The cruise came a year after the beloved Bostonians decided to get back together. Legions of haters derided the comeback as the second coming of the lamest part of the ’80s, but it’s been huge. Even the new album was surprisingly un-terrible. Knight had high hopes for the reunion, but the repsonse has been beyond his expectations. He figured the New Kids would do maybe 15 or 20 dates and call it quits. But their first North American run went so well a second leg was added. Then came a European tour and now this third U.S. lap. How does a bunch of dudes remembered as much for their lunch boxes as their hit singles get a second career 20 years later? Is it imprinting he’s thinking of? Especially if that specific time in your life involves New Kids dolls, sheets and lunch boxes. Or a midnight buffet and sighting of Joey Mac on the high seas. Jones Beach! 1988! from LET'S GET THIS FOUNDATION on Vimeo. 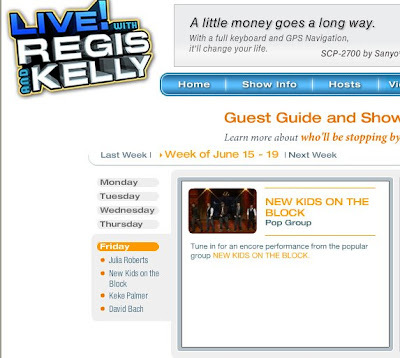 I think this is just a re-run, so if you missed it the first time, check out Regis and Kelly tomorrow. Thanks to Nora for the update. For those of you who signed up for the LiveAutographs.com, the guys will be doing the autographs and messages on July 10. Thanks to Lisa for the update. Here is an interview with Jordan and Danny on KRZ in Northeast PA.
Unforunately, the Australian tour has been cancelled. Here is a statement from the official site, a blog from Donnie and info on how to get a refund (Thanks Noreen). Due to circumstances beyond their control, the New Kids On The Block have been forced to cancel their upcoming Australian tour dates. The group is incredibly disappointed and very sorry they won’t be able to perform in Australia at this time. The guys are very grateful for all the love and support from their Australian fans. In response to so many of the Aussie fans amazing efforts and the collecting of signatures of thousands- our promoters, as well as our management team, worked incredibly hard to make an Australian tour a reality…. Despite warnings that the financial problems plaguing the world would compromise the Australian tour- they never gave up on this dream and neither did we. I’m sorry to say that now- it is true. We are not going to Australia. Like many of our fans down under- we too are saddened. Australia has always, ALWAYS, been one of our favorite places to travel to. And quite honestly- we tried very hard to make it work. However- we are, in fact, in the middle of a worldwide recession and we just cannot make it work. It is just too complex at this time. We can only assure you that when the recession’s stranglehold on the world’s economies eases up a bit- we will find a way to make this work. Thank you for understanding and please trust- that we will do all we can to continue to give The Fullest Of Service to all of our amazing fans WORLDWIDE. PS- The Party Is Not Over!!!!!!!!!! All credit card bookings will be automatically refunded back to the credit card. Cash refunds are available at the point of purchase or at a Head Office Agency. Cash refunds will only be permitted to theoriginal purchaser with photo I.D. Refunds can also be obtained by mailing tickets to the below address for a cheque refund. Cash refunds are available at Head Office Agencies. Cash refunds will only be permitted to the original purchaser with photo I.D. Refunds can also be obtained by mailing tickets to the below address for a cheque refund. QLD - Shop 95 Elizabeth St Brisbane or the Gold Coast Arts Centre. The girls don’t hide in Joey McIntyre’s hotel bathroom anymore. For one thing, fans of New Kids on the Block are no longer girls but largely women in their 20s and 30s. These days, McIntyre said, it’s more like a fan messaging him on Twitter about 1,000 times in hopes of a reply. The boy band, hugely popular in the late 1980s and early ’90s, begins its summer reunion tour Thursday night at Aaron’s Amphitheatre at Lakewood. McIntyre, 36, answered a few questions Monday. Answers were edited for length. Why is the tour starting in Atlanta? We love Atlanta. It’s all good, but logistically, it worked out because they had a few days open in the venue and we could set up the new stage and get our bearings down. A little bit of both. All of the New Kids are in a caged ring. Who’s the last man standing? Danny [Wood] is in pretty good shape. 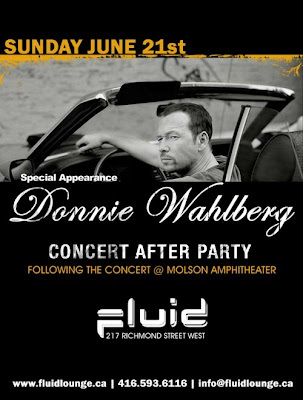 Donnie [Wahlberg] is a pretty substantial guy. Jordan [Knight], no joke, he’s pretty agile, so I could see him like Spider-Man up on the cage there. I’d really have to lose my mind and freak out and just freaking lose it and scare them, maybe gouge their eyes out or something. Why did you decide to keep touring after the fall reunion tour? [The fans] were receptive to the idea and it went back and forth, and I think it’s a great way to end it. … The fall tour, coming back the way we did, was really special. But [the summer tour] definitely reminds us of back in the day. These summer tours, this is really kind of how we earned our wings as performers and professionals. … I’m not calling it a farewell tour. I’m not going to play that game. How often do you look at your Wikipedia page? Never, actually. I don’t Google my name, either. There’s plenty of ways to take the temperature of your so-called celebrity and, really, all of them are pretty much toxic. What’s something you want to do professionally? I think theater and stage. I grew up in it and I was lucky enough to do a couple of shows in New York. That’s in my heart. Rob Lewis (a member of the band) posted some behind the scenes videos of rehearsals and more here. It will ask for a password and that is "blockdreamer".